Western Mindanao State University (WMSU) once again has translated its illustrious slogan-La universidad na servicio del communidad [The university in service for the community]. 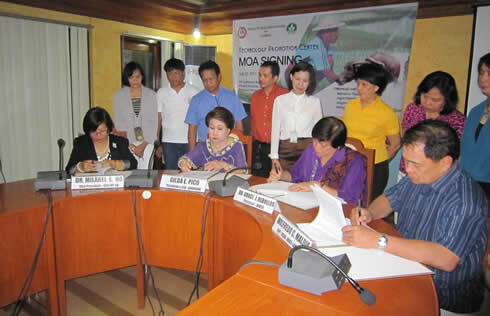 July 22 marked another milestone for the university as it entered into a memorandum of agreement (MOA) with the Land Bank of the Philippines in line with the project “Technology Promotion Center Program”. The event was held at the Office of the President’s Conference Room of the university. The MOA is rooted on the objectives: promote appropriate, updated and sustainable technologies that will generate and enhance production and post-production efficiencies to increase income of farmers and fisher folk; the bank’s lending programs through technology validation and facilitate the development of enterprises of farmers, fisher folk and SMEs through technology transfer coupled with appropriate financial assistance; and lastly to facilitate technology transfer by showcasing sustainable technologies to serve as a learning center for farmers and fisher folk. The rationale of the partnership was delivered by the university’s Vice President for Research, Development and Extension and concurrent Vice President for Academic Affairs-Dr. Milabel E. Ho during the brief program prior to the MOA signing. WMSU President-Dr. Grace J. Rebollos together with Dr. Milabel E. Ho, Land Bank President and CEO Gilda E. Pico and EVP/Head of the ADBS-Land Bank-Wilfredo C. Maldia sealed the MOA. Present during the event were several WMSU officials and deans and other representatives of the Land Bank of the Philippines. In lieu with the project, Land Bank will serve as a channel for countryside development by providing financial/credit assistance to small scale farmers to improve their economic activities through establishing viable technologies as a livelihood activity especially on high-value lowland crops. Land Bank will provide funds for the selected technology, while WMSU will establish demo farms to showcase the performance of high-yielding crops. Setting up of techno-demo farm is one of the activities under the management of the Office of the Vice President for Research, Development and Extension. With a timeframe of 12 months, there are four techno-demo farms under its supervision: Palayamanan and Organic Fertilizer, Organic Rice, Banana Tissue Culture, Agro Forestry on high value crops; and a community extension on Recycled Paper and Feather Board as the fifth component.